Since winning her first art scholarship at age 10, Marta Nelson has continued a career in fine arts. A life-long love affair with drawing the human figure developed when she attended her first life classes at Chouinard’s Art Institute, and later, after many years of teaching painting and sculpture, she discovered the joys of print-making, mostly intaglio and relief techniques. Nelson has lived and painted in Ojai for over 20 years. 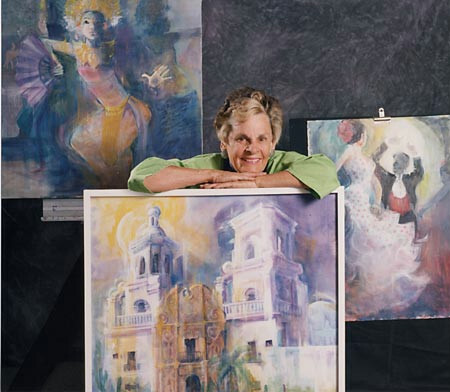 She, along with Bert Collins and Gayel Childress, conceived the first Ojai Artists Studio Tour. The results have been thousands of dollars contributed to arts education as well as tremendous economic vitality to the Ojai Studio Artists and the community of Ojai. In addition, these three women have been instrumental to the success of the Ojai Art Center, helping to shape its future for generations to come. Nelson’s art often reflects her interest in dance, her garden and Ojai itself. She works in both acrylic and watercolor and several printmaking techniques. Her paintings and prints hang in private collections across the United States and from Mexico to Japan. Marta Nelson’s documentation took place in 1997 and 2006 and was sponsored by Paula Spellman. The FOTM Archive contains extensive information about this artist.